It just occurred to me that I haven't written about the beach I have been visiting very frequently over the past few weeks and it's inhabitants. Last year I was told about a beach on the South Coast of Cornwall where a Grey Seal pup is born every September at roughly the same time. Others were concerned about it due to the beaches accessibility from land. Although Grey Seals pup just outside of the holiday season there has been a rising number of tourists still around throughout the autumn. 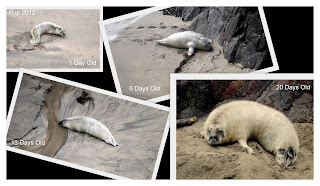 I went there twice in 2011 to observe from the cliff top a fully moulted pup or 'weaner' which had been left in the normal way by it's mother to figure out how to feed and swim for itself. Both visits were in pretty bad weather and I didn't see any others on the coastal path on either days. So a year went past and I have since been visiting the beach and a mother with a pup around twice a week. Nearly every time I have been there I have seen people on the beach at very close proximity to the pup so I have climbed down to speak with them about not disturbing pup or in some cases mum and pup. I find it really difficult to chat with people and I have been received in a number of ways. I understand it is odd being approached by someone with absolutely no authority and asked to get off a beach so I try just to suggest they hide behind some of the rather large boulders available for cover and then explain how important it is not to disturb the pup. Occasionally the mum is also on the beach and I can explain that us being on the beach is preventing her from feeding the pup, mostly people then suggest getting to higher ground and enjoy watching the pup feed from a distance. When I am not there I do worry and am always anxious to get back to make sure the pup is OK. Along with other people I am really worried that if the mum is disturbed too much she will stop using it to pup on. As with other wildlife Grey Seals have lost an enormous amount of habitat to humans through development, increased tourism and ignorance from various people taking part in various activities around our coastline, generally unintentional. It is so important we raise awareness of how we interact with wildlife and at every opportunity take responsibility for our actions. Most people who wonder down to the beach have no idea there is a pup on there and then have no idea how to engage with it. What is the best way to communicate to people effectively? How can we stop people going down to the beach? Should we stop people going down to the beach? 1 Seal looks at you : stay still and quiet, avoid eye contact.